Prayer is the mightiest weapon! ???????? Home | A Miracle Every Day | Miracles | Prayer is the mightiest weapon! ???????? Today, we’re continuing our week on how to become an ambassador of heaven. Prayer is the Christian’s mightiest weapon…it has the power to change a story’s course and even influence God’s heart. I’m convinced that God’s heart was deeply touched to see His child stand in prayer for these two cities. With each request Abraham made, God accepted it and continued to listen patiently. You are an ambassador of heaven, and your prayer carries the same weight as Abraham’s! 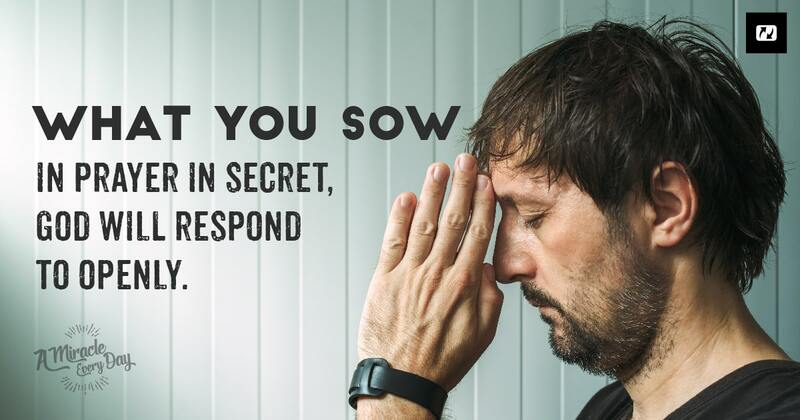 What you sow in prayer in secret, God will respond to openly. If you don’t know how to pray for your family, children, studies, professional or romantic future, friends, etc., I encourage you to go into your room and simply declare scriptures over these situations. Prayer can make a huge difference in your life, the lives of those who are dear to you, and the circle of influence that God has entrusted to you. I invite you to pray…that’s how God’s love will shine all around you! Dear father in heaven, I pray that you will guide Taylor to make the right decisions with her mom, because you know what she stands in need of. Teach her how to pray. Thank you Lord. I would like prayer for anxiety and menopausal issues. Thank you and God Bless you.